Please refer to Admissions Requirements before proceeding. The Graduate School Application form should be completed in entirety. 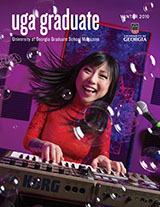 Academic program information for degrees and majors can be found in the degree programs section. Applicants should contact the academic department to which they will apply for information on supplemental application forms and materials that may be required by the academic department. Do not use this application to apply for the MBA program. Apply directly through the Terry College of Business. Do not use this application for a Juris Doctorate program. Interested in Graduate Legal Studies? Apply directly through the Law School. Do not use this application for the MPH program. GO TO THE ONLINE APPLICATION!